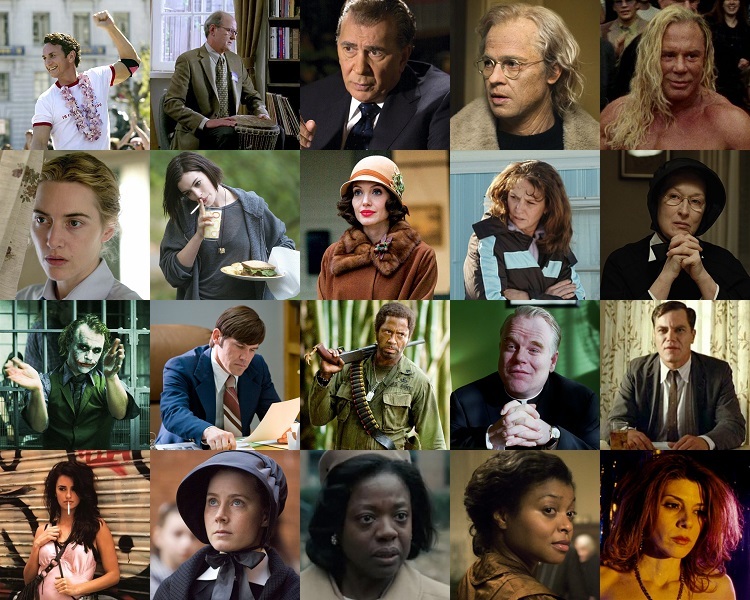 Can you pick the performances that snatched an Oscar nomination for Best Actor, Best Actress, Best Supporting Actor or Best Supporting Actress when given a brief description of the character? A gay rights activist and politician. A widowed professor living a solitary life who, upon returning to his Manhattan apartment after a longer absense, finds two illegal immigrants living there. A disgraced former President who agrees to be interviewed by a TV journalist. A man who is aging backwards. An aging professional wrestler who, despite his failing health and waning fame, continues to wrestle in an attempt to cling to the success of his heyday. An illiterate woman on trial for being an SS Guard on the death march following the 1944 evacuation of a concentration camp. A recovering drug addict whose antics threaten to overshadow her sister's upcoming marriage. A woman who insists the boy returned to her is not the son she reported as missing, which ultimately leads to her confinement to a psychiatric ward. A single mother who, in order to make the payments for her mobile home, smuggles illegal aliens from Canada to the US. The strict principal of a parish school. A psychotic criminal mastermind and self-described agent of chaos who rises from the underworld by thrusting a whole city into anarchy. A method actor who refuses to break character until he has recorded the DVD commentary. A priest who is suspected of molesting an altar boy. A damaged man who has been in an insane asylum, where he has been treated with electroshock therapy. A mentally and emotionally unstable woman who has been in a tumultous relationship with her artist ex-husband. A crucial witness in the case of a priest molesting an altar boy. The mother of an altar boy who might have been molested by the priest. The adoptive mother of a man who is aging backwards. A stripper who befriends a washed-up professional wrestler.